Things To Do in Bali - Experience the unspoilt charms of peaceful tropical islands of Nusa Lembongan or Nusa Penida with Bali Cruises. Bali’s premiere offshore destination for marine life and water sports or simple relaxation in pristine waters and golden beaches is easily reached with the vessel of your choice. Enjoy a dinner cruise around the harbor featuring an International buffet and various live entertainments. Bali Cruise - Cruise to Lembongan island aboard Bali Hai Cruise and moor alongside our purpose built reef pontoon for a full day's activities, above and under water. 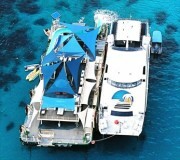 The Island Reef Cruise offers a full day’s activities - above and underwater. The luxury Bali Hai II catamaran moors alongside our purpose-built pontoon in peaceful Lembongan Bay. (departs 9:15 am and returns 4:15 pm) See the island’s exotic marine life and colourful corals from the comfort of semi-submersible coral viewer. Bali Cruise - Experience the unspoilt charms of a peaceful tropical island with our Beach Club Cruise to Lembongan Island. 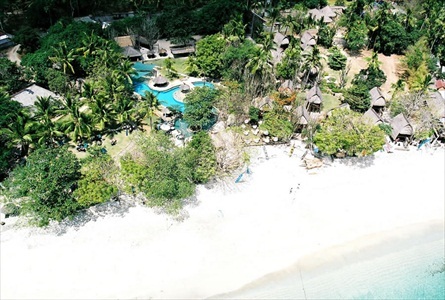 you are transferred to our private Beach Club only minutes away from the poonton. Here you can relax on golden sands, lie back in the shade of the tranquil gardens, or cool off in our lagoon pool. If the mood takes you, an array of activities to add to the tropical atmosphere there is an appetizing BBQ lunch, which includes salads and fresh fish grilled at our pool-side cabana. 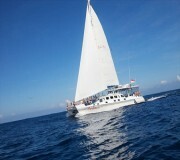 Bali Cruise - Sail away into paradise aboard Aristocat - The Luxury Sailing Catamaran. This stunning 64ft vessel is equipped to the highest standards and departs from Benoa Harbour to the idyllic isle of Lembongan, off the south-east coast of Bali, where you can experience the unspoilt charms of a peaceful tropical island. Enjoy a day in the pristine bay at private Beach Club, where you can relax on golden sand, lie back in the shade of tranquil gardens or cool off in a lagoon pool. Bali Cruise - Experience Bali's fastest and most exciting full day cruise as you discover the magnificent sights of Bali's three sister island. Ocean Rafting, designed with the highest safety standards and equipped with 750hp, promises an exhilarating day of sight seeing and snorkeling at some of Indonesia’s finest pristine coral reefs. Bali Cruise - Ever dreamt of being swept ashore onto your own private island paradise? 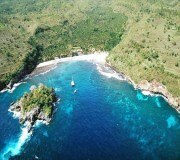 Go back to nature, relax and escapeinto crystal bay, Nusa Penida. Begin the morning sailing to Crystal Bay in Nusa Penida onboard Aristocat, our 64ft luxury sailing catamaran. Located on a remote tropical island, you’ll be swept ashore at Crystal Bay, exclusive to Bali Hai Aristocat guests only. Named Crystal bay because of its clear waters, guests will have the opportunity to snorkel some of Indonesia’s best coral reef, teaming with tropical marine life. The Castaway experience is a complete haven of relaxation. Massage is available to guests throughout the day or simply relax in a hammock overlooking the bay. Things To Do in Bali - The best way for divers of any level of experience to get a taste of Bali's world class diving enviroments. Perfect for the diver and a non diving companion. 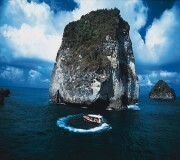 Packages includes either one or two dives and all the benefits of your cruise. Bali Hai Diving is Bali islands premier PADI 5 star dive and cruise operation. We have Cruise and Dive programs to Lembongan and Penida. Lembongan and Penida island is home to simply some of the best diving in the planet. Lembongan island itself was even listed as one of the top 20 places to visit in the world. These islands are home to stunning reef walls, drift dives, tranquil tropical bays and big oceanic species like Manta's and Oceanic Sunfish. The diversity rivals anything on the planet. Bali diving cruise trips to these islands combine diving with a Bali Hai Cruise. All divers will travel to the island on board a Bali hai cruising. You can choose to sale on either the Bali Hai II motorised Catmaran or the Aristocat luxary sailing catamaran. Our specially buit pontoon caters for non-certified divers. Our experienced dive instructors will show you the underwater world and you can gain your first step into PADI certification.